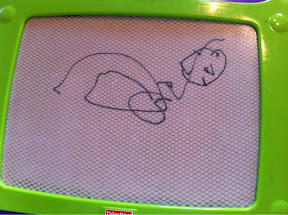 Today Luke drew Mom a picture of a turtle. I thought he did a halfway decent job for a soon to be 3 year old. Most of the art I see of his is from his kid's day out class. The crafts he brings home are usually lots of things glued together. To see him draw something from scratch is pretty neat.